Clinical nutritionist Jay Robb created the 3 day Fruit Flush Plan for people who feel they are in need of a detox and are showing signs that may include bloating, fatigue, irritability and carbohydrate addiction. 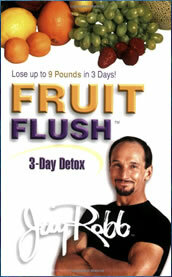 Jay Robb says that by eating specific foods dieters can remove toxins and flush away extra pounds in just three days. He claims that the key to maintaining health and long-term weight loss is to eat a balanced healthy diet with periodic cleanses with fresh raw fruit. This is a 48-page book that gives instructions for a 3-day cleansing diet based on protein powder and fruit. Fruit forms the basis of this diet and it’s high content of water, fiber, antioxidants, vitamins, minerals and low glycemic index carbohydrates are said to help dissolve toxins, improve liver function and increase energy levels. The first day involves protein drinks that are taken five times a day at two hourly intervals. Dinner is a large raw vegetable salad with lean protein and olive oil or avocado. Days two and three involve a serving of fresh fruit in place of the protein drinks and dinner is a large raw vegetable salad with olive oil or avocado and a protein drink. Robb advises dieters to avoid cardio and weight training exercises for the duration of the plan. Fruit Flush costs $5 and is available in both hard copy and e-book format. It is also necessary to purchase whey protein powder and a large amount of fruit. Can increase motivation to stay with a longer-term weight loss plan. Good to neutralize the effects of overindulgence prior to commencement of a healthy lifestyle eating program. Can help reset the appetite in favor of healthier foods. Most people enjoy eating fruit. May be difficult for those with hypoglycemia and blood glucose imbalances to follow. Hunger and fatigue may be a problem for many dieters. May interfere with ability to carry out normal daily activities. Promises quick results that may not reflect a true weight loss. While diets that overemphasize one food group to the exclusion of others are usually not recommended as a healthy approach to dieting, Robb avoids most of these problems by advising that the diet is only continued for 3 days and by including adequate amounts of protein and healthy fats in his plan. His claims that dieters can lose 9 pounds in 3 days may be seen as misleading as it is not physically possible to lose this amount of fat in such a short time, so it is important to bear in mind that most of the weight lost on this plan is likely to be water. Nonetheless this plan will be safer than many other detox plans for the majority of dieters, and will likely give a boost to motivation and energy that can kick start a lifestyle healthy weight loss program. I am at the end of my third day. I stuck with the program exactly. First day was hard as I was tired, second day I had a headache and third day not so bad. I drank a ton of water, too. My issue is that there has been no flush. I hate that the flush did not work for me, but at least I have not had sugar or caffeine for three days. I have a heart condition and I did do the diet, however on day 3 (today) I was not feeling well at all so I stopped. I think that this diet will effect each person differently. The great thing is I lost 6 lbs in 2 days and my system really flushed out. I did not do the protein drinks just fruit only. I at apples, oranges, bananas, kiwis, pears, strawberries & melons. I drank a lot of water. I ate when I was hungry and and stopped when I was full, so it didn’t matter wether it was lunch, supper or breakfast. I highly recommend this diet to everyone, however make sure you are careful. You all know your own body and how it feels etc. Can you drink coffee or tea? If I am taking a Women’s One A Day type vitamin, should I stop taking it during this time frame? Does anyone know?? I bought Weider Whey Protein and it says 500mL of cold water with one scoop of the powder (scoop is included). I’ve tried one tonight, and it tastes pretty good…I have the Peach Mango flavour. I had dreams about food but I stuck it out and got results! I want to try this really badly. I think I will after my mom’s birthday on Saturday. I was just wondering how much water and protein you need each time on the first day and which fruits? Also does it matter the brand of whey protien? And does it matter how old you are? Thanks. Day 1 and am hungry and tired =( Gonna stick with it! I am not looking for a quick weight loss as much as jump starting my metabolism and getting rid of toxins. I’m on day 2 of the flush and so far so good. I was a little bit hungry the first day but the protein shakes kept me full (I’m using Jillian Michael’s brand so use a scoop and a half). Day 2 is really easy so far. I really enjoy the fruit part and feel like I’m eating a lot. This flush does make you very tired though…that is the only negative I’ve experienced so far. I’m not weak, just feel like I can sleep for days. I’m at the end of my 2nd day and I’m not sure how I feel about it. I’ve followed it to a T and I’ve actually gained a couple of pounds. I’m very tired and sluggish. I’ve also not really been able to use the bathroom, which I thought was supposed to happen even more so. I peed A LOT the first day with all the protein drinks but the other hasn’t really happened much. And when it does, it’s pretty uncomfortable. Probably more info than you’d like but I wanted to let everyone know my own experience with this detox. I personally would love to do this Flush but I am envolved in alot of sports and dont know how this would effect me in them. can i ask you what protein drink must i drink?? can i drink milk protein drink 1 box every hour on day 1?? komii, i tried strawberries, mangos, pineapple, oranges, apples, melon, cherries what ever type of fruit you like really! This flush worked great for me! I felt so much healthier and light. I stopped eating junk food after the flush and i must have lost about 8lbs. I am going to do it again soon. Hope it works for you if you try it! how much does this diet lose pricicely and what type of fruits are best ?? Trisha- There is such thing as too much protein-your body turns any excess protein into fat or just flushes it out! I wouldn’t totally skip the protein day you definatly need it but that amount is crazy. Try doing three days of the fruit and raw salad. This is a great detox plan. For those of you that think you can skip the protein, or that it’s too much protein, you really need to reevaluate that!!!! Your body MUST have protein in order to function. Protein feeds muscles, which in turn burn more calories. No protein will lead to fatigue. Some studies suggest that what ever your body weight is, you need half that in grams of protein daily to build muscle and lose fat. Don’t skip the protein!!! Hey what’s a good protein drink to use? I don’t need to get big or anything. I want the most organic and healthiest protein shake I can get. I’m new to diets, as I have always eaten fatty foods and whatever I want. My addictions need to be eradicated and I need the best, so I can enjoy and feel better and know what the best is. oh…and did anyone buy the book? is it helpful or can you do it without the book? thanks again! I have to do something and I thought this would be a good kick off. Does anyone know…what do you mix the whey protein powder with? Water? Milk? Thanks! I can’t wait to start! There is no such thing as too much protein. I disagree with Sarah’s comment to skip the protein day as protein is an essential part of a persons diet. If the person who created the diet recommends including protein, then I would think that is how the diet should be followed. So many essential nutrients are already being cut out in this diet, I would not eliminate the protein. I think you’ll find it will be even more difficult to function on it if you do. A person usually can drink up to eight to ten cups of water a day. The water consumption varies on the height and weight you are now. I am going to try the detox diet. skip the protein days, just eat fruit and you will see a result plus your metabolism will restart so you aren’t hungry for more calories than you need anymore! I’m doing this tomorrow, can’t wait because this works really well for me although I am SUPER tired and can barely stay awake and in a good mood all day. DO THIS DO THIS DO THIS!!! Oh and yes drink loads of water. It’s not just water weight that you will lose because it actually stays off. what sort of whey powder is recomended?? Can you drink as much water in a day as you want?